Reliable and affordable domestic cleaning services in Boston Manor W7 performed by professionally trained cleaners from First Class Cleaner. Get a free and non-obligatory quote now! We are an established cleaning agency that is very respected by citizens and several organisations. For a long time we’ve been helping Londoners keep their houses neat and healthy. 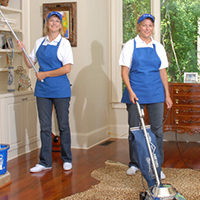 Our business is dedicated to domestic cleaning: a service quite popular and demanded in town. We want to keep helping customers with their household responsibilities and strongly encourage you to take a look at what we do. Our domestic cleaning service is very accurate and precise. This is because we are a serious company and will never tolerate disorganisation or bad attitude. Our maids are good, conscientious people who are very devoted to cleaning. They work hard. We’ve made sure they get all the necessary training on a regular basis so that they become better and better. We also offer innovative cleaning. Throughout the years we have tried numerous techniques and methods until we found the ones that serve us well. What does our service include? First, we need to point out that there are two options for you: one-off cleaning or regular cleaning. If you need regular maintenance of your home because you don’t have time to do the housekeeping, then the second option is for you. But if you need a single service to quickly put your home in order, then you can go for a one-time session. How to contact us? Recently we established a call centre in which we put a lot of effort. There we have employed a team of skilled and knowledgeable representatives that are prepared to serve customers on the phone. They will tell you what you need to know about the service and its features. They can help you arrange a cleaning session, will discuss days that are convenient for you, etc. So, if you have any questions, you are free to call our assistants and demand more information. They will gladly give you a hand. Get in touch with them now.